The Cheetah was a sports car built from 1963-1966 by the famous Chevrolet performance tuner Bill Thomas. Bill Thomas shows off the finished car - the engine setback is very noticeable here. The Cheetah was a sports car built from 1963-1966 by Chevrolet performance tuner Bill Thomas. While never said, many surmised that it was to be a competitor to Carroll Shelby's Cobra. The fact that it was designed and built as a GT coupe may bely that notion. It is more likely that competing in sport car races was considered good publicity for Bill and it was likely that he hoped to deliver enough victories that he would increase potential sales - if he beat the Cobra (and other competitors) so much the better. Bill had had tremendous success racing Corvettes in the late '50s and as such, he gained the attention of influential people at GM. In 1960 Thomas had his own company and he developed other successful Chevrolet models as the Corvair and Chevy II. In 1963, Thomas gained covert support by the head of GM's Performance Product Group, Vince Piggins. As such he began to develop a concept vehicle, which was really to be street sports coupe - smaller and lighter than the Corvette. The major components - the Corvette engine, transmission and rear-end assemblies were supplied by GM. This prototype was designed by Thomas and his lead fabricator Don Edmunds. Edmunds was responsible for the majority of the construction. The project was mostly financed by John Grow, a California Chevrolet dealer, who received the first car. Edmunds laid the Corvette driveline out on the shop floor and began determined the basic outline of the chassis. Surprisingly, the original "blueprints" of the Cheetah consisted of only a few simple drawings. The bulk of the initial drawings show each major component drawn out in block form, with major dimensions marked. Once the basic chassis shape was set, Edmunds sketched out the body, and then showed his drawings to Thomas. After a few minor changes, Edmunds was given the green light to begin construction of what was originally meant to be a cruising machine - or no more that styling exercise that Thomas wanted as a prototype to show GM in the hope of winning additional sub-contract work. The chassis was constructed of chromoly tubing that was arc-welded. But sometime in the early construction in 1963, Thomas decided the car should also compete on the racetrack to further promote the concept and his work. But this change in purpose was to some degree responsible for the chassis flexibility problems that would emerge when the car did compete on the racetrack. The design of the car was unusual in that it was front engined, but with the engine sitting so far back in the chassis that the output yoke of the transmission connected directly to the input yoke on the differential without an intervening driveshaft. With the engine positioned in this manner, the driver's legs were beside the engine. For this to work, the exhaust system headers passed over the top of the driver's and passenger's legs. The tops of the foot boxes were curved to make room for Edmunds' handmade headers. Consequently, this design gave a front/rear weight distribution roughly approximating a mid-engined vehicle without the cost of an expensive transaxle arrangement. But this design style also meant a very hot driver's compartment since it was a closed coupe - an issue that would haunt the Cheetah on the street and on the track. When the lower half of a rolling chassis was completed, Edmunds constructed a plywood body buck which fit on top of the chassis. The buck included removable metal frames which showed the outline of the windows. (This buck is shown in the Hot Rod Magazine article cited). The body buck and forms were sent off to two subcontractors; California Metal Shapers and Aircraft Windshield Co. The returned rough body was finished by Don Borth and Don Edmunds. A second car was constructed with an aluminum body, however, the remainder of the cars were done in fiberglass, produced by two different companies - Contemporary Fiberglass and Fiberglass Trends. Despite the fact that the car suffered from the typical problems that plague any new project, the car won a number of races in 1964 in the hands of some capable drivers. 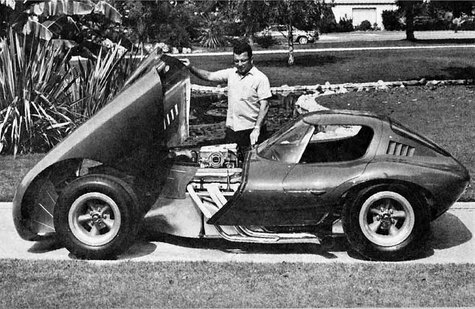 Jerry Titus drove the factory Cheetah in its early races. Ralph Salyer who owned and drove the most successful racing Cheetah, in which he won 11 minor events between 1964 and 1965. His car was known as the Cro-Sal Cheetah, named for Gene Crowe and Salyer. It is also became the only Cheetah roadster after Crowe cut the roof off to keep Salyer from suffering heat exhaustion due to the aforementioned heat buildup in the driver's compartment. The engine was also prone to overheating, due Thomas's failure to consider vents to draw hot air out of the engine compartment. Eventually, the overheating problems were solved by using a larger Pontiac NASCAR radiator, by cutting various configurations of holes in the hood and lastly by adding spoilers to draw the hot air out from underneath the hood. Another major problem was the result of their mid-stream change to a racing sports car. Since the car was originally designed as a proof-of-concept, the chassis lacked the rigidity necessary for racing. Thus the vehicle proved difficult to handle even for experienced drivers. And later HP increases further aggravated the problem. Under hard acceleration, the trailing arms tended to bow outwards, making the rear wheels to toe in. Some owners of the car were able to improve handling by adding gussets and triangulation to the chassis. Some modified the trailing arms and disc brakes. The ultra-compact driver's position exposes the direct contact with all that engine heat.